So the last season of Sherlock ended with Sherlock leaping off of a building to his death. 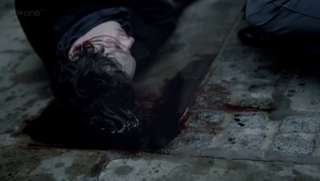 I realize that the show is an updated version of the original books and that Sherlock did take a tumble off of the Reichenbach falls in the story and faked his own death. But seriously, I'm not entirely sure that this show is going to satisfactorily answer how on Earth Sherlock managed to survive jumping off of a building. His brains were on the sidewalk. Then again, this show is written by the same guy who's currently writing Doctor Who, so if anyone can bring someone back to life after they've fallen from a great height, it'll be him. Personally, I'd love it if he regenerated into Basil Rathbone.